The FMCS Institute for Conflict Management delivers practical, experience-based, conflict resolution training for individuals and groups. Institute training is specifically designed to meet the real-world challenges of labor-management relations and organizational change. Programs provide participants the opportunity to interact with and learn from experienced practitioners. Institute staff is comprised of FMCS mediators, FMCS National Programs and Initiatives staff, and private sector arbitrators. Sessions are held at locations nation-wide. The FMCS Institute is an approved SHRM Recertification Provider! 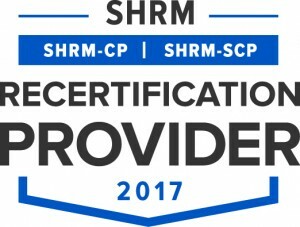 The Society for Human Resource Management (SHRM) has approved the FMCS Institute to join their Recertification Provider network. The FMCS Institute may now award SHRM Professional Development Credits (PDCs) for individuals seeking to recertify for SHRM-CP and SHRM-SCP certificates. Contact Lynda Lee at llee@fmcs.gov for more information. Thinking about becoming a labor arbitrator? This program is geared toward labor-management practitioners with substantial experience in industrial, labor, and employment relations looking to develop the skills essential for labor arbitration. Integrating theory and practice, this course focuses on participants developing a conceptual understanding of the mediation process as it is applied to workplace issues. Resolving conflict can be challenging. Asking the right questions the right way is a key skill for anyone who wants to be an effective problem-solver in the midst of conflict. Learn to develop the negotiation style, from traditional to interest-based, that is right for you and the bargaining climate in which you work. Immerse yourself in an intensive program designed to enhance the arbitration skills of experienced labor relations practitioners. Enhance your arbitration and advocacy skills in a course that addresses both private and federal sector rules in a course designed for experienced labor relations practitioners. Each and every day, we encounter people whose behavior comes across to us as obstructive,obnoxious, stubborn, offensive, or worse. What are the roots of difficult behavior ? After this presentation, participants should be able to identify issues associated with workplace bullying and how they may turn them into EEO complaints & grievances; identify best route for resolution of bullying complaints; assess strategies before, during and after an episode of bullying; and identify management and workplace allies to deter and or resolve bullying issues. Learn skills that will enable you to become a more effective neutral by identifying the subconscious and instinctive mental processes that can impact your ability to remain neutral. Explore and practice how to best use questions to bring parties that are in conflict together, and facilitate problem-solving discussions. Emphasizing evidence and witness examination in labor arbitration; this course expands upon the Institute’s basic course: Arbitration for Advocates. Whether you are a facilitator or a participant, this training can help your meetings be more energized, more effective, and more efficient. People who participate in your meetings in the future are likely to say, “That was a great meeting!” rather than, “I couldn’t wait for that meeting to end!” The 3-day version will give you many meeting strategies, including ways to prepare for meetings, problem analysis tools, interest based problem solving, communication techniques, decision making tools, and many ways of responding to difficult or dysfunctional behavior. This highly interactive three-day course also offers an optional “add-on” over Thursday and Friday to provide significant focus and role playing, as well as additional content such as group mission statements, feedback mechanisms, and ways of involving remote participants. While days 1-3 provide all the foundation you need to stop the meeting madness, the optional days of 4-5 will take that tool kit to a higher level!